The one thing going for Sam Smith's pus is their cask old brewery bitter. This pub however does not serve it. Nevertheless, it's a pleasant enough place for a few pints. 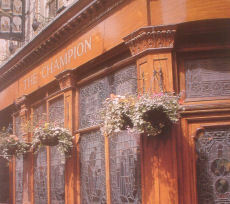 Typical Sam Smith's pub for the area, with no real ale and modern stained glass windows installed by Smith's in the late 1980s. 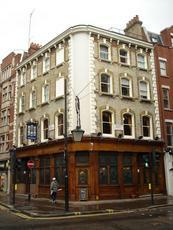 Having dipped my toe into Fitzrovia at the Blue Posts I ventured further & found this lovely place. Beautiful stained glass and timber work. Let down a bit by indifferent service, but that can be overlooked if you are just in for the one. Gorgeous Sam Smith's corner pub. The usual hallmarks of tasteful old-school decor, good beer and very resonable prices are all present and correct. Extra marks for the fact that it has stained glass windows all around which creates a lovely backdrop and atmosphere and would be a suitable place to impress any visitors from overseas if you had some with you as it is in effect a slightly idealized version of a traditional British boozer. Nice touch of the dart board in a alcove. Seems a little cramped when you enter but there's more room upstairs. Service on my visit was very good, no long waits although it was reasonably busy, no sign of a bad pint or short measure and very polite too. Highly recommended. This pub doesn't serve any hand pulled ales.